The Jaguar Club of Pittsburgh holds their annual “Sewickley Show” every August, on Broad Street in the elegant downtown area of Sewickley. Traditionally, it has been exclusively for the fine motor cars of Jaguar, Rolls Royce, and Bentley. For the second year in a row, the show’s horizons are expanding to include a Special Invitation to car owners of the 2017 Italian Cortile. To qualify for an invitation, Italian Car owners must be registered and display their vehicle at the 2017 Cortile. Applications can be submitted at the Cortile Car Show on July 15-16. An application fee (see below “Showing Options”) will be required at the Cortile. Invitational Winner's and alternate's will be announced On Saturday July 15 at 1:30pm. Due to overall limits of the venue itself, ONLY 10 ITALIAN CARS WILL BE INVITED. Additional information is as follows. Background of the Location: "The Village"
Sewickley is an Indian word for "Sweet Water" and has a history that dates back to the mid 1700's, with the first written mention of Sewickley dated December 31, 1767. Sewickley is one square mile with a vibrant business district, the Sewickley Valley Hospital, YMCA, Public Library, Community Center, Sweetwater, and numerous churches. WHEN: Saturday, August 12th, 2017 rain or shine. TIME: Check in 10 - 11AM at the registration table. Final cleaning 10:00 AM – 12:30 PM. Judging begins at 12:30 PM. The roots of this show date back to the mid 1980’s, and over the years, it has been in several elegant locations leading up to its present location in downtown Sewickley, where it has been for quite a few years now. A relaxed atmosphere with car aficionados is the mode of the day. ​The idea is to (1) give these elegant cars a chance to be “exercised” and enjoyed by all of us “die-hard” car people, and (2) get out and enjoy the company of other car enthusiasts and the passersby of an admiring public. The venue of Broad Street in Sewickley, sets the pace of an elegant atmosphere, in a quaint and comfortable business district. It is also noted that there will NOT be any “vendors”, but there will be full access to all the businesses and restaurants that dot this pleasant area of Sewickley. Participants will choose to be in either of two categories, “Display Only’ (not judged), or the “Judged” category. Though judging is not mandatory, it is conducted in a very casual fashion that is best described as “Concours-lite”. It does NOT involve the demanding detail of a formal Concours, but has just enough to still be relaxed and simple. Due to the limited size of the location, this show has an overall total car limit of the 50 cars, 10 of which are allocated to the Italian Cortile, and the balance to the Rolls Royce/ Bentley guests, and Jaguar Club cars. This is an exclusive and welcoming invitation to Cortile registrants to share participation in one of the Jaguar Club of Pittsburgh’s private shows. Should there be any questions, please feel free to contact Chuck Pipich via the noted info on the top right o this page. Category #2 -- Informal Judging (Concours “Lite”, fee $20) Classes will be grouped according to model, series, year, and number of entries. 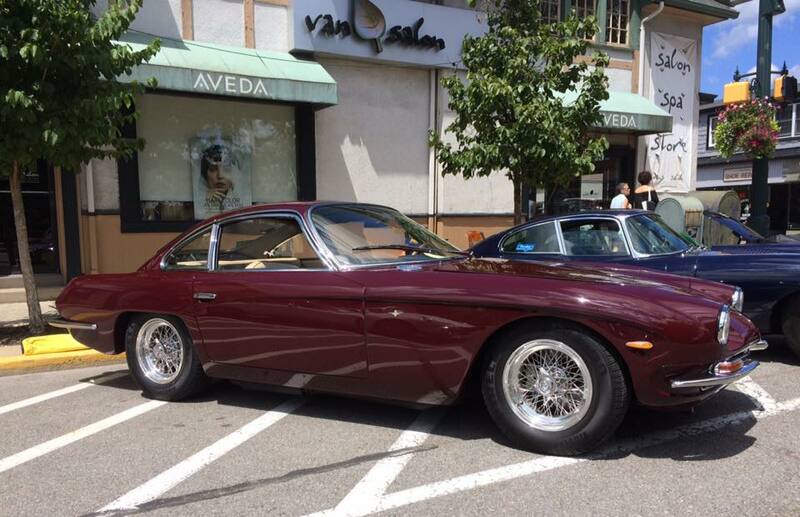 Italian Cortile participants will compete among other Italian car entries. Fee is $20 and judging format will be informal, i.e. NOT to the serious requirements of a full blown formal Concours. A maximum of three trophies will be awarded in each class, depending on participation. Will be awarded according to the votes cast by the admiring public and interested passersby. This will be via paper ballots cast into a ballot box, and counted before presentation of awards. The show committee will provide ballots etc. Any registered entry (both display only and judged categories) are eligible to win.